It began in 1935, before the inception of the Motor Carrier Act. not as Shippers Express, but as two brothers, John and G.O. Kerr. The place was Logtown, MS., and it was depression time. Equipment was open top, with window glass windshields. Tires were hard, and roads were dirt and gravel. Driving was mean, with loading and unloading an unremitting test of strength. Rain and sun, bugs and fog, heat and cold alternated to strain patience and endurance. But endure they did, eventually securing operating authority between Logtown and New Orleans. The late 1930’s saw the depression overcast begin to thin. Scattered patches of blue sky began to appear. At the same time other clouds were building into ominous thunderheads of war in Europe. Finally came the day of infamy with Japan. In the meantime, though, these two young brothers were honing their skills in the art of transportation and though the war delayed their business plans, it did not deter their enthusiasm. In 1945, returning to civilian pursuits, the opportunity arose to acquire an insolvent motor carrier. This interstate operation opened the doors to all of Mississippi for Memphis and New Orleans. A banking relationship was forged with Mississippi’s largest financial institution. A growth opportunity began which continues to this day. Eventually, this small operation, consisting of ten power units, and maybe twenty trailers expanded. They became Delta Motor Line, Inc. By the mid-and late fifties, through acquisition and foresight they opened in Chicago, St. Louis, and Little Rock. With energy, long hours, and skillful management these two Logtown loggers had built a major transportation company. It didn’t take long to outgrow their facility on Gallatin Street in Jackson. In 1955 they purchased a 14-acre site just south of Highway 80, near the Jackson Coca-Cola Bottling Plant. A modern, state of the art motor freight terminal was built. Innovative concepts of cross-dock management were put in place. 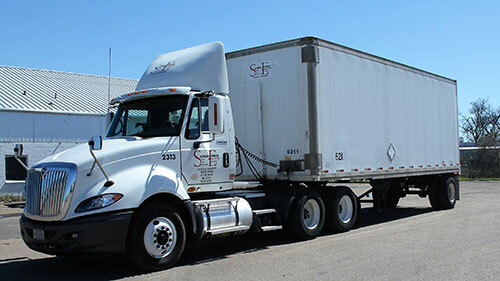 Major equipment purchases were made, modernizing and upgrading their growing fleet. New jobs were created, and the 24-hour, seven-day-a-week terminal operation became a reality. In 1962, culminating 17 years of an upward spiral, they sold Delta Motor Line, Inc., to the Arkansas Best Freight Line, known as ABF. By innate business acumen they retained most of their real estate, including their yet new terminal. This building was later leased to the federal government for use as the Post Office Distribution Facility. In 1963, while still in their forties, John and G.O. obtained a dormant Mississippi Intrastate Authority. It was a restricted set of rights, severely limited in scope. In fact, it was a one way permit. They could load out, but not back. It was the opportunity to begin anew. Shippers Express was born. Once again, a two-man-operation took root. As the sixties progressed so did Shippers Express. Employment grew as more services were provided. Through constant effort, and determination, additional intrastate authority was granted. Applications were made to the Interstate Commerce Commission for interstate rights between Mississippi, Louisiana, and Tennessee. Terminals were established in New Orleans and Memphis, plus others throughout Mississippi. So in just a few short years this inseparable duo had rebuilt by one half all of what they had sold to ABF. Continuing their innovative posture, the Kerrs pioneered motor carrier computerization in Mississippi. Tracing techniques were upgraded. More sophisticated statistical tools were developed to assure more productive management…to meet the challenges of deregulation’s onslaught. The slow but sure acceleration of deregulation became a real presence in 1980. Competitive pressures intensified, both at the rate level, and increased carrier population into Mississippi. Shippers Express joined the movement by applying for, and receiving authority to all of the southeastern states, plus Arkansas and Texas. However, the Kerrs quickly determined that such an expansion would jeopardize operations, not the mention the financial integrity they had so carefully nurtured. Equally as stressful it would place their company in an unfavorable competitive stance alongside the major long-haul carriers. Consequently, they made one additional expansion move to Birmingham, Alabama. This gave them operations in every major distribution point within 300 miles of Mississippi. A total, well-defined scope was established. The decision was made to do the best possible job within the scope. There was no terminal beyond 250 miles from the breakbulk terminal in Jackson. This virtually assured the shippers and consignees at any point within this territory of consistent next-day service. The 24 hour breakbulk operation encouraged pool distribution. The marketplace was demanding lower rates, while still expecting premium service. Shippers Express met the challenge with imaginative rate making, tailored to their clientele’s needs. Simultaneously, by intense supervision they maintained an outstanding record of next day service…and astonishing 99%! So here it is now Shippers Express, Inc., Mississippi-developed, Mississippi-owned, and Mississippi-operated. 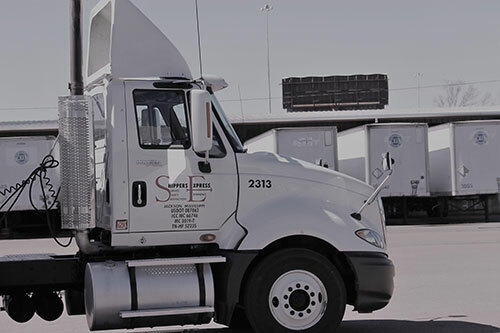 Although Deposit Guaranty Bank after several name changes has become Regions Bank, it is still the financial institution of Shippers Express, Inc. Continuing the tradition, Larry Kerr, son of G.O. Kerr, following lengthy service in training, is president and CEO. In a market atmosphere dominated by conglomerates, complex management structures and impersonal relationships, Shippers Express remains a constant personal factor. It daily generates a presence of over a half century of transportation experience – a strength forged in those hard depression years – tempered by the discipline of work – and structured by dedication to principles of service and integrity. Shippers Express – for you . . . expressly.